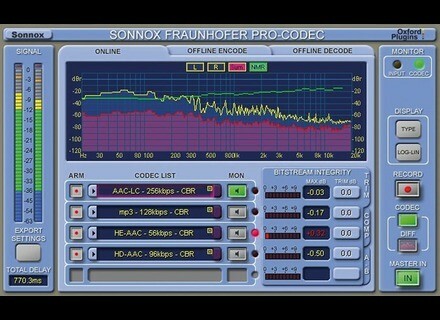 Fraunhofer Pro-Codec, Other Music Software from Sonnox. 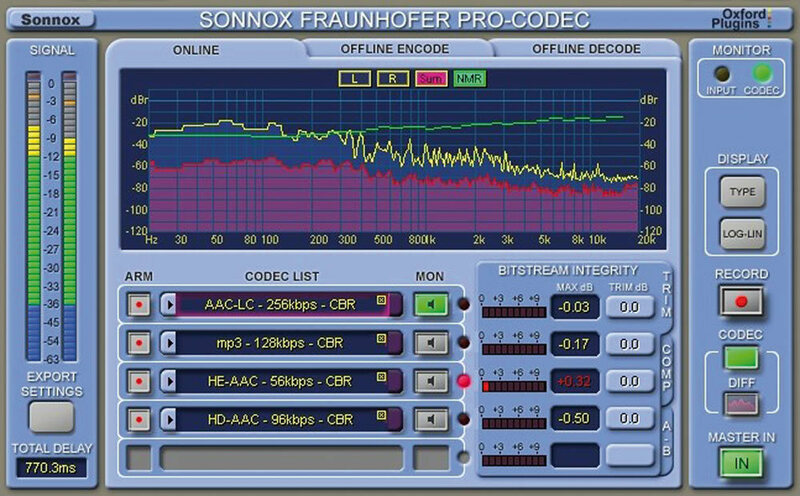 Sonnox has announced the release of the Fraunhofer Pro-Codec, a plug-in designed for the real-time auditioning, encoding and decoding of audio signals using Fraunhofer codecs. Mix and mastering engineers may now audition up to five codecs in real time within a DAW environment. The Sonnox Fraunhofer Pro-Codec plug-in enables the production of mixes, and provides the option to batch encode to multiple formats. Major codecs, including: mp3, mp3 Surround, AAC-LC and HE-AAC are supported, as are such lossless codecs as mp3 HD and HD-AAC. Sonnox has devised a FFT display which illustrates the input and output difference signals and a graphical indication of codec-induced noise audibility. Bit-stream level meters display the possibility of decode overloads. A-B auditioning enables engineers to switch between codecs, or input and codec. A blind listening mode (ABX) further supports codec comparisons. mp3, mp3 Surround, AAC-LC, HE-AAC, and HE-AAC v2. mp3-HD and HD-AAC (Lossless Codecs). Ability to select up to five codecs for simultaneous export, in real time, to encoded files. Ability to audition the difference between input signal and codec output. AB auditioning in real time between codecs, or between codec and input signal. ABX mode for blind statistical testing. Display of the Input signal and Diff signal. Indication of the audibility of audio removed by the encoding process. Bitstream levels and ability to compensate for overloads. Indication of filesize or datastream compression. The Pro-Codec costs £295 / $495 and is available for Windows and Mac OS X in VST, AU and RTAS effect plug-in formats. Rob Papen Punch v1.0.0a Rob Papen has released version 1.0.0a of its Punch virtual drum synthesizer instrument for Windows and Mac. 7AIR DRX8R 7AIR has announced the release of DRX8R, a freeware reverb/compressor effect plug-in for Windows. LinPlug Mac OS X 64-bit Versions LinPlug has released Mac OS X 64-bit versions of Albino, Alpha and CronoX.